Not only can Butler Pavers provide your home or business with the colors of your choice, we also offer countless patterns and designs to choose from. Specific-shaped bricks and pavers can only be used in specific patterns, so Butler Pavers will work with you to find the right look for your patio, walkway, entranceway or pool deck. Customers can pick a paver they like and see what patterns will work with it, or pick a pattern and then find a suitable paver. 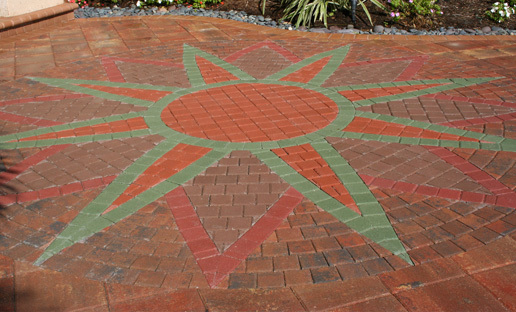 In addition to paver patterns, Butler Pavers can install non-standard patterns and designs such as fans, circles, stars and even dolphins. Butler Pavers can work with a client to come up with a custom design or custom inlay. Take a look at some of the patterns below, or give us a call and see what we can do for you.